In Flint, Mich., Moving The Farmers Market Drew More Poor Shoppers : The Salt Flint's water woes are in the news, but the city is also a food desert. When its farmers market moved closer to public transportation, it made healthy foods more accessible to low-income shoppers. When the Flint Farmers' Market moved downtown, closer to public transportation, more low-income customers started shopping there for all their grocery needs, a new study finds. Making farmers markets more accessible to Americans in food deserts can boost the number of low-income customers who regularly shop there, and may even offer more promise for improving diets than bringing in traditional grocers. 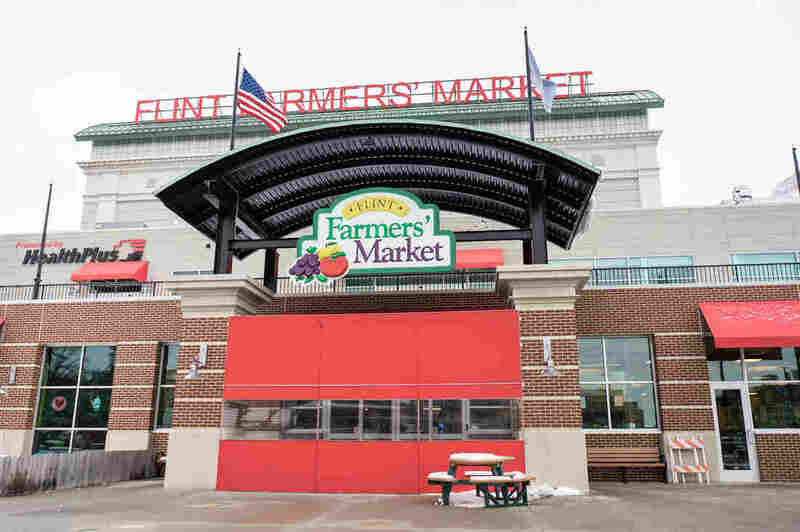 That's according to researchers who looked at what happened when the farmers market in Flint, Mich. — much of which qualifies as a food desert — moved downtown. Rick Sadler, a public health professor at the Flint campus of Michigan State University, first interviewed shoppers at the Flint Farmers' Market in 2011, seeking to understand the demographics of its customers. Three years later, the market made a controversial move from an industrial area north of the city core — inaccessible to public transit and pedestrians — to a central downtown location across from the bus station. That prompted Sadler to return in 2015, to see if the customer demographics had shifted. They had: At the new location, the market was seeing far more shoppers from the city's poorer neighborhoods. As Sadler reports in a new study in the journal Applied Geography, in 2011, about 10 percent of the shoppers came from the city's most distressed neighborhoods, but by 2015 it was up to 20 percent. Similarly, less than 1 percent of farmers market patrons had taken the bus there in 2011, but 6 percent had after the move. And while that might not sound like much to New Yorkers, it's significant in Flint, says Sadler, who has also been documenting the city's water crisis. "Flint's nickname is 'Vehicle City'; most people here do drive," he tells us. An increasing number of shoppers also used the market for general groceries, with 20 percent reporting that as a reason for coming to the market in 2015, compared with 14 percent in 2011. That was particularly marked, says Sadler, among residents who said they had difficulty accessing food: 27 percent of those shoppers visited the market for general groceries, compared with 13 percent of those reporting no difficulty accessing food, he told us. That may be, in part, because much of Flint meets federal criteria for being a "food desert," a community without sufficient access to grocery stores. The city has lost more than half of its population since the 1960s, and it has a poverty rate of 42 percent. In 2013 and 2014, three of the city's major grocers — two Krogers and a Meijer, a local competitor to Wal-Mart — shut down. "The market basically exists as a supplement to the lack of grocery stores in their neighborhoods," Sadler says. Indeed, use of the federal Supplemental Nutrition Assistance Program (SNAP) at the Flint Farmers' Market has increased dramatically since 2011, going from just under $65,000 a year to nearly $140,000. That's according to the Fair Food Network, which runs Michigan's Double Up Food Bucks, a program that gives SNAP clients a dollar-for-dollar match up to $20 a week to spend at farmers markets. Between 2011 and 2015, the group says, Double Up Food Bucks went from roughly $37,000 in sales in Flint to $111,000. That lines up with what researchers analyzing double bucks programs in Michigan and elsewhere are finding. 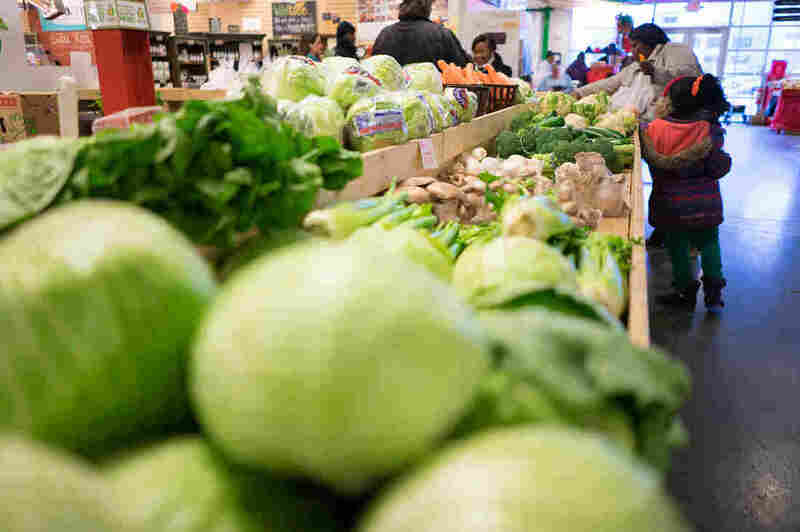 "In low-income communities, we find that access and affordability are cited [by residents] as the two biggest barriers to having more healthy food," says Oran Hesterman, president of the Fair Food Network, who's overseen the group's Double Up Food Bucks program since its inception in 2009. But, he adds, "the desire for healthy food is not limited by income or ZIP code." Capitalizing on that desire, says Sadler, might be more feasible with farmers markets — and other smaller-scale efforts — in a struggling city like Flint. Big chains like Kroger, he says, need to reach a certain level of profit to keep stores open. "When you're dealing with a huge chain, it's easier to write off a store," he says. But a smaller store — or even a farmers market — is different, because it's unlikely to just pick up and leave. "You still make money, you still have an interest in making a business out of it," he says; the scale of profit just might be different. "But you want to be able to contribute something to the community."